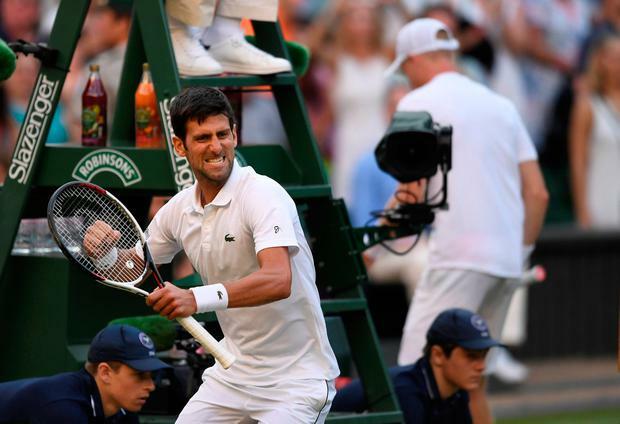 Novak Djokovic took a swipe at the Centre Court crowd after defeating Kyle Edmund to reach the fourth round of Wimbledon. Edmund was hoping to make it a double English sporting celebration after the players took to the court minutes after England had booked their place in the World Cup semi-finals. The occasion almost certainly contributed to the fevered atmosphere, which was fuelled further by Edmund winning the opening set before Djokovic fought back to win 4-6 6-3 6-2 6-4. After the Serbian was given an overdue time violation in the third set, the crowd cheered exuberantly, prompting Djokovic to blow sarcastic kisses in their direction and cup his ear. At the end of the match, Djokovic eschewed his now customary demonstration of love for the fans, instead performing a leaping fist-pump towards his box. Djokovic felt the crowd crossed a line, saying: "I got a time violation deservedly. I thought the crowd's reaction after that was quite unnecessary. "A couple of guys were pretending they were coughing and whistling while I was bouncing the ball more or less to the end of the match at that end where I received the time violation. "I played Andy (Murray) a couple of times (at Wimbledon). I played him in the Olympic Games. It was not like this, definitely. "They kept on going, provoking. That's something that I can tolerate for a little bit, but I'm going to show that I'm present, as well, that they can't do whatever they feel like doing." Edmund relished the atmosphere and did not feel the crowd went over the top. He said: "I'm not aware of that. It's not really my job to get too much into that. For me, I'm British. I'm playing in front of the British crowd. I'm just trying to soak it all in and enjoy it. "I've played in Serbia. Serbian fans obviously supported Serbian players. That's normal. When you're on Centre Court, to have the crowd behind you, it's a great thing to have." Djokovic reacted with incredulity and his frustration was compounded when Garner ruled he could not challenge the subsequent desperate shot Edmund scrambled for a winner - TV replays backed up the Serbian on both counts. Djokovic did not attach any blame to Edmund, though, with tennis etiquette putting the onus on players to hold their hand up and admit a double bounce if they are aware. Djokovic said: "Kyle is a very nice guy. I know him and have tons of respect for him, his team. We get along very well. Nothing against Kyle there. You couldn't know. He was running towards the ball and he just hit it and he dropped his racket. It was quite a strange decision from the chair umpire, but it happens." Edmund added: "You need television to see it. If in real life it's hard to tell, then it's hard to tell for me when I'm scrambling." There are no British singles players through to the second week for the first time since 2007 but Edmund again showed how much he has improved and is continuing to improve, bullying Djokovic in the opening set with his forehand. The 23-year-old reflected positively on his best Wimbledon run, saying: "Today was reasonably good. Not too much in terms of margins. "I would have maybe, looking back on it, liked to have been a little bit more aggressive at stages. But easier said than done when you're in rallies. I just would have liked to have won today, but it didn't happen. I think overall it's been more positive from my side."